Amadeus and the Mekong Tourism Coordinating Office (MTCO) is jointly organising the first Mekong Trends Aviation Seminar, which is scheduled to take place in Bangkok on the 10th of October. The inaugural Mekong Trends Aviation Seminar will highlight the key insights of the recently published Mekong Trends Snapshot on Air Transport in the Greater Mekong Sub-region (GMS). Both the report and the seminar intend to emphasise the importance of aviation in the development of the region’s tourism. According to the report, over the last 20 years, air transport in the GMS helped to open up many destinations in the region such as Siem Reap in Cambodia, Luang Prabang in Lao PDR, Danang in Vietnam, Mandalay in Myanmar and Guilin in Guangxi, the People’s Republic of China. The trend accelerated with the emergence of budget airlines. New air routes today link destinations such as Sihanoukville in Cambodia, Khon Kaen in Thailand, and Pakse in Lao PDR, destinations which were barely noticed by travellers before. Mekong Trends is a public-private partnership to deliver valuable industry intelligence on specific and relevant topics. Published for the industry on behalf of the MTCO and the National Tourism Organisations of the six member governments of the GMS, Mekong Trends is owned and operated by CEN International. The first Mekong Trends Snapshot on Air Transport in the GMS was released in June this year during the Mekong Tourism Forum 2017, a platform for GMS travel industry collaboration supported by the Asian Development Bank. The report can be downloaded for free at www.MekongTrends.com. 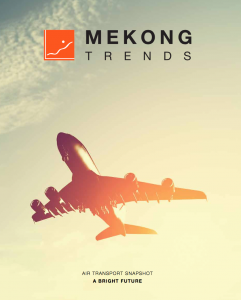 Key insights of the report will be used to discuss the state of aviation and connectivity in the Mekong Region during the Mekong Trends Aviation Seminar hosted by Amadeus. The seminar will take place on 10 October, from 16:00-18:00, at the Amadeus Executive Briefing Centre in Bangkok, Thailand. Entry is free, but registration is required. For more information, please click here.